Description: A rare set of CN SD75Is' make their way towards FL. with 6,600' of autoracks in tow. Description: CSX Q197 passes Jefferson St. in ATL. These hockey fans aren't seen much in these parts. Description: CSX Q197 waits out it's turn to leave Howell Tower, even though there's not a tower there anymore. Description: CSX Q197 passes under the bridge at Tilford Yard. Description: CN 387 waits to head south. Description: southbound at Milwakee jct. 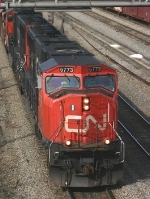 Title: CN 5773 at Oxford Jct. Description: As seen aboard the Westbound Ocean #15. Description: 2 SD75Is lead a west bound at Durand Michigan. Description: cn 5773 on a westbound at Durand Michigan. Description: After a days worth of work the WC waits for rested road crew to take it to Stevens Point. Description: CP train #388 with a unique leader swing into La Crosse on a cloudy gray Winter morning. Description: CN Engine 5773 pulls into Partridge Yard with SORE1. Description: CN Engines 5773 & 5615 pull into Partridge Yard with a loaded SORE1.